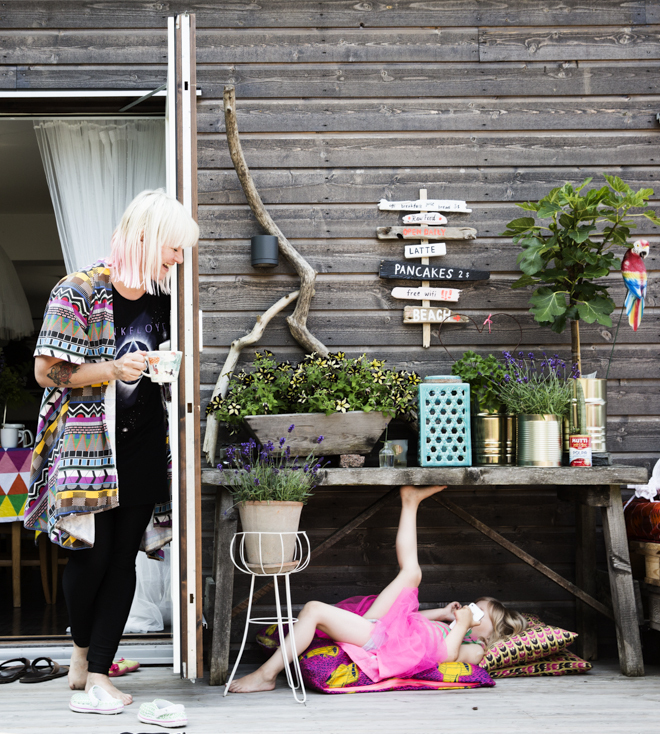 This is artist Jennie Blomkvist where she likes to be the most: on the deck with her daughter Jill. I went to visit her with my camera and today I want to show you her home that she calls her playhouse. Jennie´s art is just like her home: fun, spontaneous and relaxed. She does not pay attention to trends and being at her house is inspiring, layed back and I can´t imagine it ever being dull. I photographed this story with writer Kicki Wieslander for Australian mag. Real Living. Jennie and Fredrik with their kids Fideli, Viggo and Jill. They live in Varberg Sweden in a house from 1938. This is where they eat all that meat, ice cream, milk, cheese, eggs and other stuff. I think Jennie was a Blythe doll in a previous life. Jill is resting her creative little mind on a futon with a cover made out of the family´s old T-shirts. Bathroom mural with the Hulk painted by cartoon lover Jennie of course. Black, white and red. Being in this bathroom is like reading a comic book. Plastic is fantastic. Candle holder made by Jennie. If your wondering what Kollijox means? This is it! Little knickknacks in Jennies home and on her mind. People who decorate in the middle of a renovation are my favorite kind of stylists. See below and above. Fashion is spelled t-s-h-i-r-t This T-shirt is kept in a box to help preserve the scent from someone that is no longer here. Jill reaching for the window in her parents bedroom. Long summer days are spent out on this deck. Jill has found some shade under this table so she can play “cut the rope” on moms phone. Such a divine space. They´ve added wheels on some pallets for a generous seating area. And painted the old wooden sofa red. Wow vad fint! Vad är det för en fin iron maiden-akitig tröja. Vad står det på den? Fin jallafall ! Det är ett lyckopiller att besöka Jennie och hennes familjs underbara hus! The t-shirt in the box. Like a beautiful haiku. Cheerful and creative home. Great individual style. And the deck is lovely. Seems like you could not get bored in this home! I really love the deck.